Hail strikes show up as discolored smudges, often oval in shape and slightly dimpled. Evidence of dimpled hail damage can also be seen on metal vents and guttering, and often the soffit and siding. This damage can't be seen from the ground. 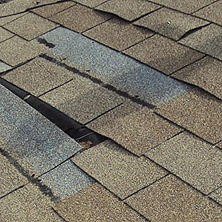 Missing roof shingles is the easiest and best way to prove wind damage, but even without that it is possible to show a need for repair. Lifting up one shingle and having four or five lift up around it shows that at some time the wind lifted the area up and broke the bond with the roof. Sometimes your property goes through a severe storm with no apparent damage. Don’t be so sure. Hail, high winds and even tornados can do serious damage that may no be noticed for quite some time. First, let’s talk about hail. 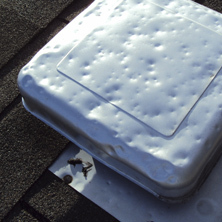 Even moderate hail can do damage to some single-ply and older built-up roofs. PVC membranes may suffer tiny shatter areas that may no leak for quite some time. The normal expansion and contraction of the membrane will eventually open these cracks enough to permit the entry of water into the system. Some hail can also damage the fins on condensing units and roof-top equipment, if it is driven by high wind. Large hail can cause immediate leakage, but no always. Membranes that are resistant to hail can be damaged, yet exhibit no symptoms for one to two weathering cycles. For instance, EPDM (rubber roofing) can be damaged by large hail but will not exhibit problems for while. Small gull-wing cuts can start to appear long after hail hits. Shingle roofs will suffer granule loss that will expose the underlying reinforcement and asphalt to UV degradation that will dramatically shorten the life of the roof. The same is true for granule-surfaced modified bitumen roofing and fiberglass cap sheets. 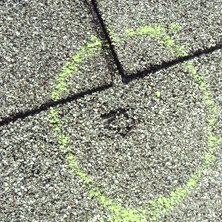 Gravel-surfaced built-up roofs may have some of the gravel driven into the top plies which can allow moisture penetration that makes the membrane slowly deteriorate. High winds and even tornadoes can also do phantom damage that is not immediately obvious. High winds are amplified by all roof structures. Parapets, large open doors and varying slopes increase the speed and pressure that high winds exert. Bear in mind that wind does not slow down as it climbs the side of a building and crosses the roof – it in fact speeds up. Various irregular shapes on and around the roof and even the building structure itself produces lift, just like an aircraft’s wing. This lift may partially or even totally destroy the attachment of your roof to the substrate. Even though this attachment may be lost, the roof may look just fine as if it was lifted and laid back down in place. However, the next high wind can have catastrophic results as it does not have to overcome the attachment as the first wind did. This can be true of all membranes, as well as composition shingles. Even if your roof shows no apparent damage after a severe storm, contact your insurance company right away and call your NSR roofing professional to inspect your roof for damage. Some tests may need to be performed to determine the extent of the damage, but the expense is well worth it because you may face much more extensive damage if you do nothing. Plus it always helps to have as much evidence as possible when dealing with an insurance adjustor. Call your NSR roofing professional if your building is hit by damaging storms, even if damage is not apparent to you. You’ll avoid frustration with your insurance company if problems are detected immediately, as well as headaches caused by leaks that could result from undiagnosed roof system damage. Granule build up in gutter could be a sign of hail damage. Leaks in the ceiling and damaged sheet rock may also be from storm damage and covered as well.